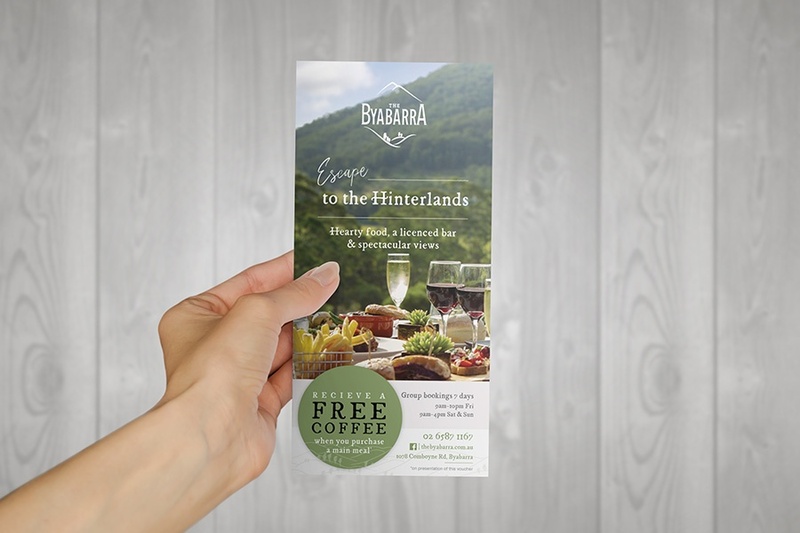 Over the last few months we’ve worked on a rebrand and advertising campaign for a country cafe & bar - “The Byabarra” near Port Macquarie. Currently well known by locals, in order to increase business they needed to attract clientele from further afield. Located in the Hinterlands, we designed their marketing campaign and rebrand to attract visitors from Port Macquarie looking for a weekend escape into the country. Surrounded by beautiful scenery and near the already popular day trip destination of Wauchope, The Byabarra has the opportunity to become a real destination for Port Macquarie residents. Our solution included: a rebrand to give the brand a fresher look with brighter colours; a general branding ad that would be advertised in Port Macquarie’s cinemas and on radio; plus print and radio advertising for major events such as Father’s Day or Melbourne Cup. The biggest draw for The Byabarra is the scenery. As a result we've featured this heavily in their brand. We took some elements from the existing brand motif so it remained recognisable to existing clientele. Our redesign is more modern and really evokes the atmosphere of peace and leisure that the cafe provides. The colour is calming, the symmetry creates focus and the brand name is nestled amongst the scenery, just like the cafe itself. Their advertising features the surrounds, as well as some close ups of delicious spreads (after all, we know people love to look at food!). With some beautiful drone shots and a relaxing voiceover, the cinema ad has already seen some traction with attracting visitors. For our first event driven campaign for Father’s Day, which included a print ad and social post, the cafe was fully booked. Over the next few months we’re looking forward to seeing The Byabarra grow and completing their rebrand with a fresh website with table and venue booking.